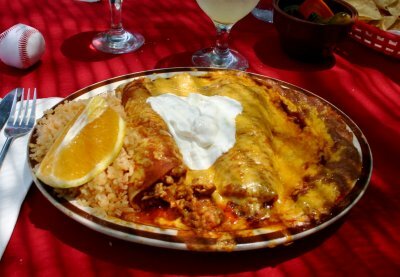 In this season of "Best Of" contests (the Register and Orange Coast recently did theirs and the OC Weekly is still accepting votes for theirs) I thought it'd be time to finally do a Best Of OC Mexican Restaurants contest on this site. What I need from the readers is suggestions as to what categories we should focus on. 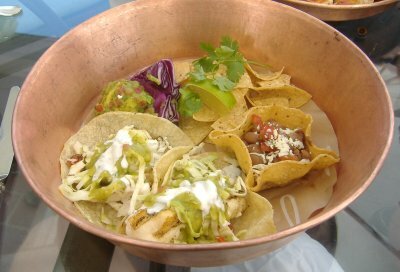 If you have an idea for a category, and it could be funny (i.e., "Best Cougar Bar") or serious (i.e., "Best Charity Events") but we mostly need food-related ones (i.e., "Best Tofu Tacos on PCH"), please mention it by leaving a comment on this thread. 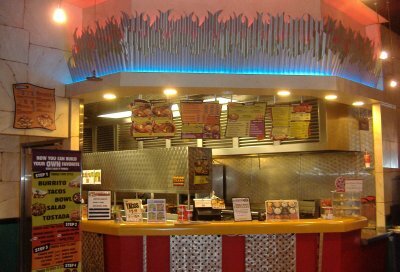 Or, if you're afraid to leave a comment, send me an e-mail at reviews@oxmexfood.com. Remember we are only trying to nail down the categories right now, not looking for nominations. If you have a nomination to make write it down or make a mental note to yourself for when nominatin' time comes. It may even be that there will be award to go to the winners. I think I'm known on this blog as being the nice guy, maybe too nice, often perceived as being afraid of pointing out anything negative about any place I eat at. I will freely admit that I am generally positive in my reviews but it's not exactly out of fear of offending somebody or some restaurant as it is that I realize that one bad item or one bad service experience at a particular restaurant may very well be a fluke, an isolated incident, a random occurrence per se, that is not representative of that restaurant's overall way of doing business. If you get something that tastes bad or you have a problem with the service then there's nothing wrong with bringing it up to the management and getting it cleared up but I do think there's something wrong with not saying anything about it to them and then posting it all over the Internet. The restaurant may have a hard time living down something that was an isolated incident. Or if there is a food item you didn't like there may still be other items on the menu that you would like if you just gave them a try. I have seen people write off a restaurant based on not liking one item. Sometimes I have seen these people go later, with some degree of persuasion, back to the same restaurant and try something different and then be converted to the place but some of these people dig in their heels, refuse to go back and miss out on things they would've enjoyed. I've also seen people go back to a place they had previously written off, order the thing they didn't like before instead of trying different stuff, then entirely write the place off forever. Yes, it defies logic, but we humans can be funny people and I am not without my quirks. This leads me to the fact that I recently found a coupon in the paper for Charo Chicken advertising that they are now serving Carne Asada and Barbacoa Steak (or Chicken) as meat choices in addition to their obvious: chicken. I clipped the coupon and a week or so later I went to the Irvine location excitedly waiting to try the new options. The clerk there though told me that the two new meats were only available at a couple test restaurants. 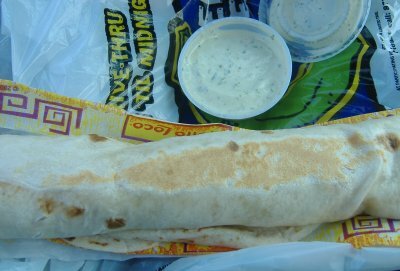 So I ordered a Moe's Favorite Potato (I conveniently ignore the fact that they now call it "Moe's Famous Potato") and thoroughly enjoyed it, as I always do, and saved the coupon for later use. A week or two later I picked up my slowly disintegrating coupon from my desk and headed to the Tustin location. This was one of two or three test restaurants so they had the meats so I ordered a Carne Asada tostada and a Barbacoa Chicken taco. The problem was the Carne Asada was too tough and dry to chew. I had a few little nibbles as it slowly dawned on me that I was engaged in a lost cause. I nibbled at the non-meat portion of the tostada then just dumped the whole thing and moved on to the taco. The barbacoa chicken in the taco was definitely more edible but I don't think chicken should ever be served in dry, crisp taco shells. Bad combo. 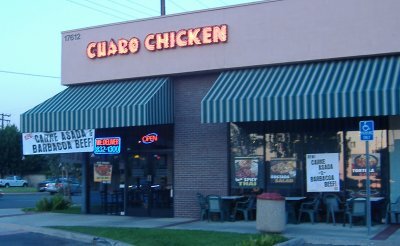 I have in no way been turned off of going to Charo Chicken. I do still love their Moe's Favorite Potato and the service has always been good but I'm thinking maybe they better stick with chicken as their signature meat. 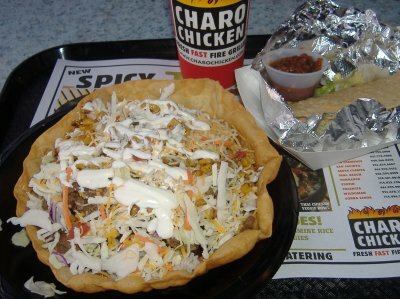 Has anybody else had an experience with the carne asada at Charo Chicken? If somebody can report a good experience I am entirely open to going there and trying it again. One of the first things I noticed as I walked in this morning was that they have breakfast tortas. 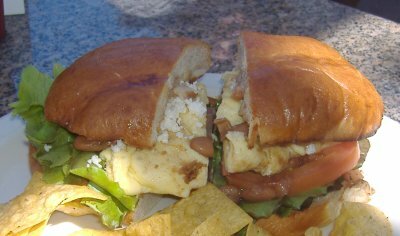 As far as I know this is the only place that has breakfast tortas. 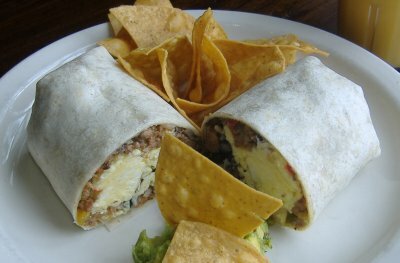 They also have huevos rancheros and several kinds of breakfast burritos. I wanted one of everything I saw but ended up going for the Picadilla Burrito: "Organic scrambled eggs, Niman Ranch sausage mixed with peppers, onions, garlic and choice of rice or pinto beans." 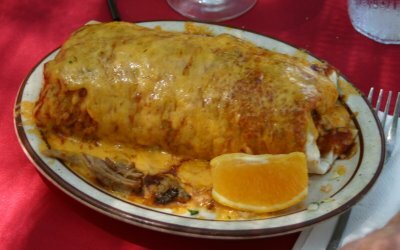 This was a very good, hearty breakfast burrito and I like that they cut it in half when they serve it; that makes it good for pictures. I forgot to add the green chile cheese potatoes on the side but I got filled up anyway and it automatically comes with a side of chips and their rustic guacamole. The total for my burrito and orange juice came to $9.70. I'll be back to try the torta and the huevos rancheros later and will update this entry when I do. 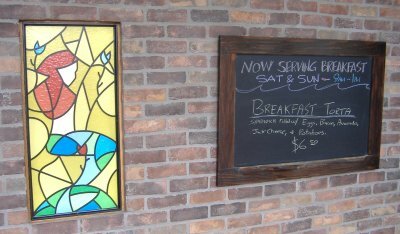 And, oh yeah, they serve breakfast from 9am to 1pm on Saturdays and Sundays so you don't have to race to get there for breakfast by 10:30 or 11:00am which are the usual breakfast cutoff times at most restaurants. Click here to see the complete album (21 photos) at . 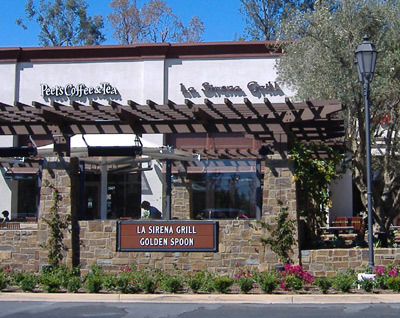 Irvine, California, September 15, 2008 — La Sirena Grill at Orchard Hills Village Center is hosting a fundraiser on Saturday, Sept. 20 and Sunday, Sept. 21 from 9 a.m. to noon, when 15% of sales will be donated to the Deanna Flock Fund. Flock is a 16-year-old Northpark resident who was being raised by her single mom, Nancy Flock, until this summer when her mother passed away from natural causes. The younger Flock was then taken in by neighborhood and family friends, the Bustos family of Irvine, so she could remain in the neighborhood and continue to attend Beckman High School. "We are happy to support this cause in Deanna's name," said Brian Hendon of La Sirena Grill. "La Sirena Grill prides itself on being part of the Irvine community, and coming together on important causes such as this." 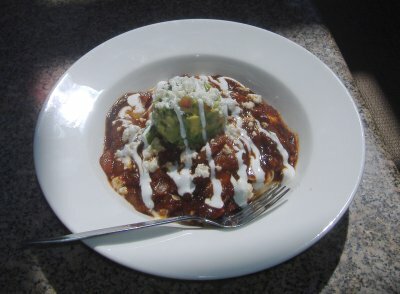 The casual eatery serves contemporary Mexican flavors with fresh, organic ingredients. The recycled wood furnishings and whimsical wall treatments create a charming dining atmosphere for breakfast, lunch or dinner. 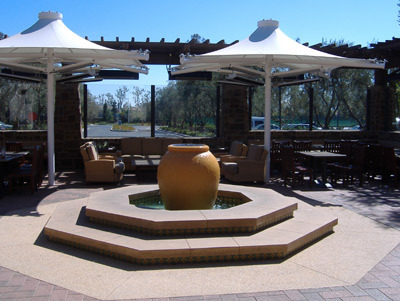 Additional seating is available in the center's open-air patio. Take-out service is also available. 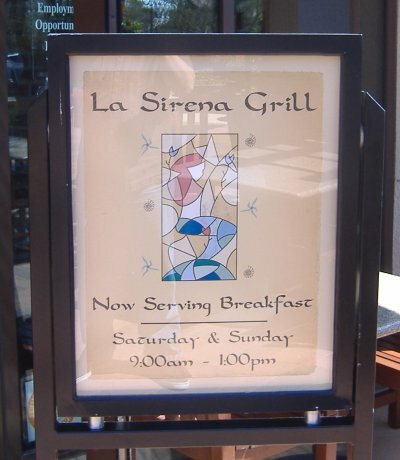 La Sirena Grill is open from 11 a.m. to 9 p.m. Monday through Friday, and opens at 9 a.m. for breakfast on Saturday and Sunday. I bet you didn't know it but today, September 16, is National Guacamole Day. (It is also Mexican Independence Day but that's a subject for a different entry. And tomorrow is Talk Like a Pirate Day.) Now, don't get National Guacamole Day mixed up with Spicy Guacamole Day, which is on November 14. Longtime readers may remember that about a year and a half ago I was contacted by editors of Tu Ciudad magazine for my opinion on where the best guacamole could be found in Orange County. I e-mailed back my opinion but my opinion was never printed. 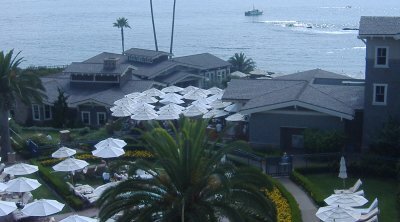 Instead, the editor gave it as his opinion that the best guacamole in Orange County could be found at The Montage resort in Laguna Beach. Later on I met the editor in person and asked him what made it stand out and he said, "I can't remember. I just remember it being really, really good." I decided I would have to try out this really, really good guacamole and more than a year later I finally made it to The Montage with a couple friends to try to track down this guacamole. 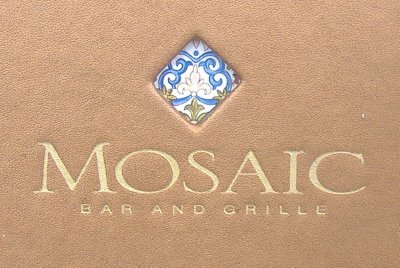 The Montage has a number of restaurants and we guessed that the guacamole might've come from the poolside bar which they call the Mosaic Bar and Grill. 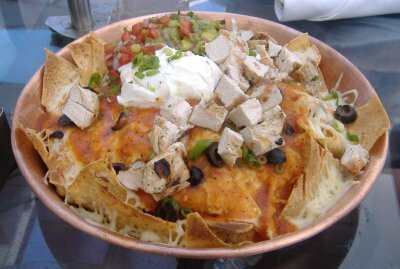 As you can see, the nachos and the tacos are both served in big brass bowls and we noticed many other patrons were also ordering the nachos and the tacos. Once again, the guacamole was pretty good. It seemed to strike the right balance between chunky and mushy and had some good spice to it and I can't say anything bad about it but I'm not sure if we went to where the Tu Ciudad editor had been before. My own total came to something like $40-45. On my budget that's something I can do maybe once or twice a year. But they have a great setting and great service so it may be worth checking out if you want to relax on the beach sometime in a nice resort setting . . . or if you are staying in a room at The Montage. 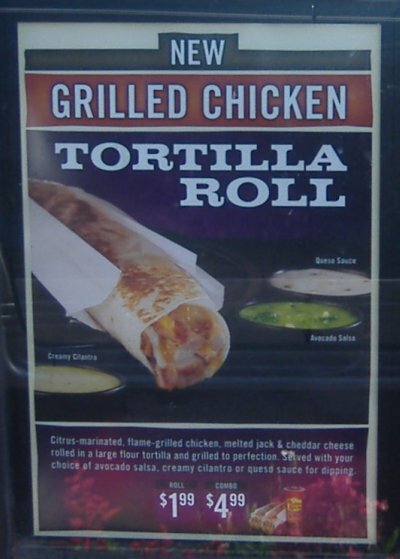 Check out Nancy Luna's Fast Food Maven blog today for the details on a new El Pollo Loco item, the Grilled Chicken Tortilla Roll, that will be hitting stores this Saturday. UPDATE: Shortly after posting this I went to the one location that already has these and tried one. Basically they are tortillas with chunks of chicken and cheese inside. The thing that made it better than just mundane was the tasty Creamy Cilantro sauce I got with it. In my day job as a web developer I recently worked a little stint at The Orange County Register. On one of those days I asked a guy in my department where he likes to go for lunch. 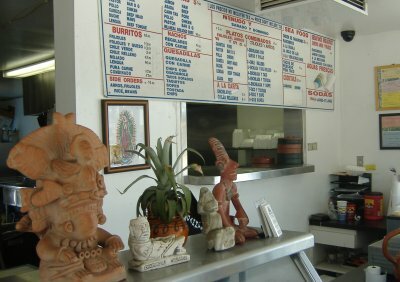 He mentioned that there was a place within walking distance called Gammy's that had great tacos. Well, of course I'd heard of Gammy's before; it's that place I've driven past a million times on the way to another place with a surprisingly similar name. I just hadn't stopped there yet and for some reason I hadn't connected that it was so darn close to the Register building. This is where it gets to the hard part: the food just wasn't very good. 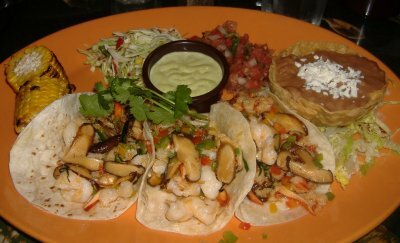 Anybody who's been reading this blog for a while knows I try to give every place a fair shake even places that I find out later on didn't deserve it at all (note Rasta Taco) but I had a hard time getting through this meal and felt sick afterwards. I'm not even sure what it was that caused it but the ill feeling was definitely for real. 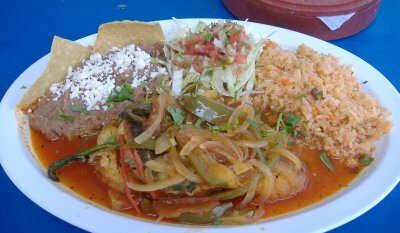 It didn't help that the chile relleno was sitting in a lot of watery sauce that just made everything on the plate kind of soppy. I barely stumbled back to my desk and my co-worker asked me how it went and I replied, "You said their tacos were good and I didn't try the tacos but maybe I should have." He said, "Yep, get the tacos." So, in an attempt to give them a second chance I went back the next day intent on just ordering tacos. This time a different cook was on duty. From the menu board I ordered an al pastor taco and a lengua taco then asked if they had any tacos not mentioned on the board. I basically said, "Give me something unusual but not gross." 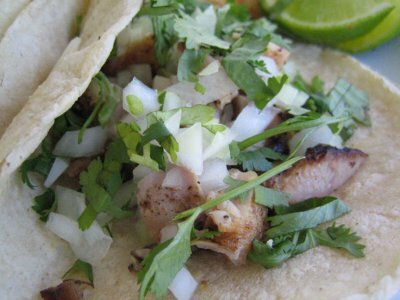 The teenager taking my order told me they had tripas tacos and said I should give them a try. Okay, I'll add that to my other two tacos (if I remember correctly the tacos are in the $1.25 - 1.75 range). I get my plate of tacos and some salsa and lime wedges and radishes and I start eating and everything's a different experience. The tortillas these tacos are in are amazing. I'm not sure if they're handmade or not; they seem like really professionally made handmade corn tortillas with a wonderful, slightly buttery flavor to them and just the right thickness. All the meats were excellent and my innards just kept wanting more. The tripas (intestine) were like thin bubbles of fat with meat all around. I looked at them and was afraid they might be too chewy but my fears were allayed upon the first bite. 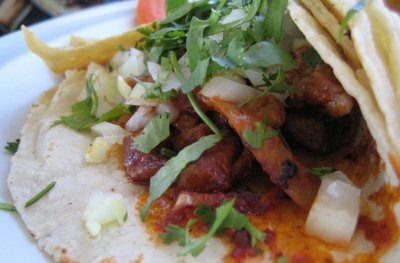 And the lengua taco didn't have that nasty taste you get in your mouth when you bite your tongue, as I've experienced in other lengua tacos before. When I finished this meal there was no trace of sickness, just a well-satisfied stomach. I marched back to my desk at The Register and reported that everything went better when I ordered the tacos. A few days later I met up with Jit Fong Chin, high school sports writer for The Register and sometimes contributor to the Gluttonista blog on The Register's website (and photographer for all the remaining photos in this entry). We met up knowing we were going to go to a Mexican restaurant for lunch but not having settled on which one. Jit suggested Gammy's, paused, and then said, "But I want to make sure the good cook is on duty first . . . "
Somehow my meals also cost less each time . . . and I always got a drink (be sure to try their aguas frescas). The first visit cost me $10.71, the second $7.20, and the third was $4.87. I think I will give them a 3.5 Speedy Gonzales rating for now. 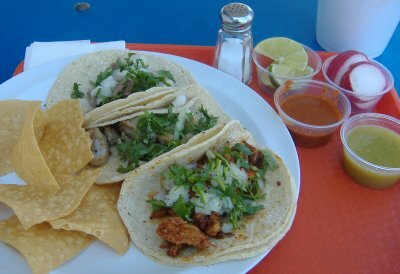 From my limited experience I can't say that you should only get tacos from there or that there really is a good cook and a bad cook that work there but I did notice a difference in my different visits there but even the Yelp listing (linked to above) mentions inconsistency in the cooking here. So my intention in bringing up the negative is more in hoping that they can smooth over this inconsistency, not to kick them down. Everyone that worked there was very nice including the guy who I think is Gammy Sr. He was very helpful and accommodating. If you've been here before or are planning on going please leave a comment to report on your experience. Very good. I think they may have their cooking inconsistencies smoothed over now. Click here to see the unedited album (14 photos) at . →CLICK HERE←to see our entire El Cholo in Orange County coverage all at once. My site traffic tells me people come here looking for info on El Cholo in Orange County but they don't click that link above that will take them to the information they are looking for so I am going to keep making the link bigger until people see it. Or HERE to see our entire El Cholo coverage in LA County. 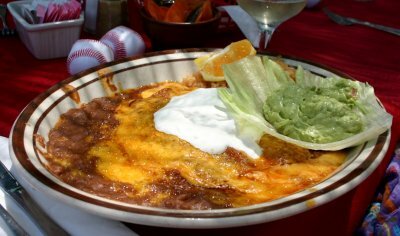 As one of the longest running Mexican restaurants in the greater Southern California area (since it started in 1923) the El Cholo chain is about to hit its eighty-five year mark. On that day, October 27, 2008, they will be offering area teachers, firefighters and police officers a free meal beginning at 5pm, as is their annual tradition. "In addition, all proceeds from meal sales that night to those employed in other walks of life will go to childrens' charities, selected by each restaurant. In the past five years, El Cholo has raised nearly $150,000 for charity from those who have come to honor our heroes with us." 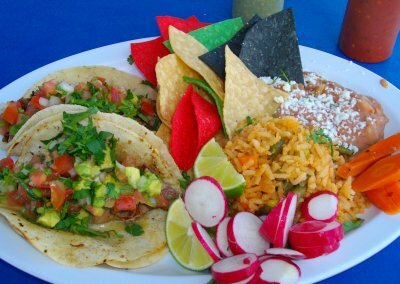 This "anniversary offer is valid at the El Cholo restaurants in La Habra and Irvine, as well as our new restaurant, Café Maiz, in Mission Viejo." Click here to download the flyer (in PDF format). Click here to get details of this offer as it relates to LA County. 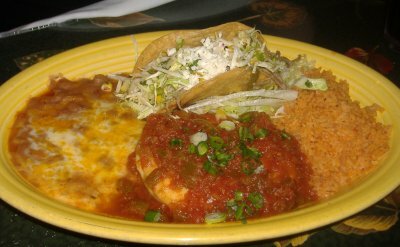 The El Cholo chain has three restaurants in Orange County and we have covered them all. See our complete coverage by CLICKING HERE. This review may be setting a new record at this blog. 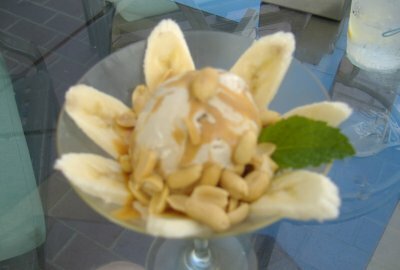 It is the first restaurant that has been reviewed three times . . . and all by guest reviewers. 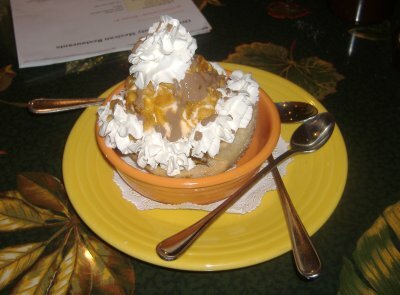 Phil gave us our original review of Moreno's but then we lost his pictures. Later on Matt gave us another review of Moreno's and fortunately we still have his great photos. Now Johnny Automatic is back with a report on brunch at Moreno's. If you want to see all this coverage at once just click on the "moreno's" label at the end of this entry. 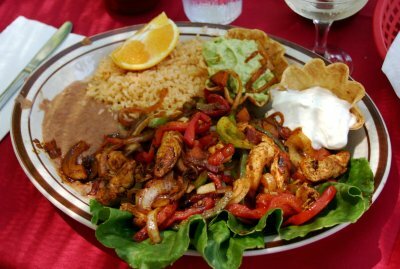 Moreno's is a staple in Orange having been around for almost 40 years. It's a landmark for that reason and because part of the complex is a historic old church that serves as a banquet hall these days. Most of the dining occurs on there big shaded patio. It gives any visit a real fiesta feel to it. You also can dine indoors. 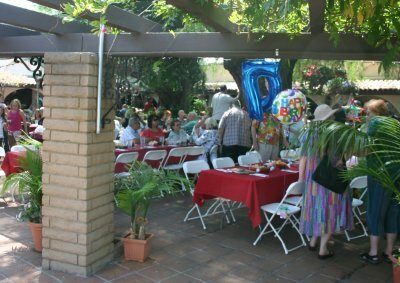 Recently I was invited to a big birthday bash held during Moreno's Sunday brunch. Like a lot of Sunday brunches they serve cheap sparkling wine with the meal. Nothing kills a day quicker than a big Mexican Champagne Brunch - a couple glasses of champagne and the carb heavy Mexican food almost always is followed by a nap that lasts until evening. While some of us had the complimentary sham-pagne, others enjoyed margaritas. They make a very good marg here. We enjoyed beverages along with chips, salsa and escabeche. 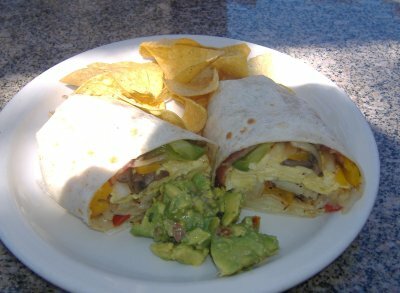 For Sunday brunch they have their full menu plus some breakfast type items all running $11.95. Technically these are the dishes that come with the free champagne, but in a big group they offer it to everyone. 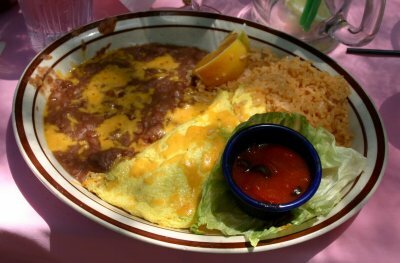 The breakfast items include classic Mexican offerings like Huevos Rancheros, machaca and chilaquiles along with American style omelets and other egg dishes. 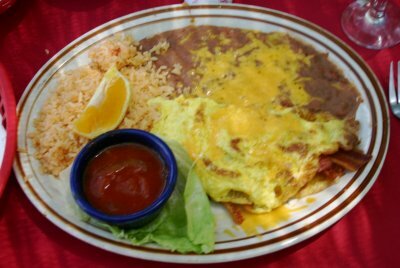 Several people in our party ordered the omelets which were well prepared and served with the standard rice and beans. 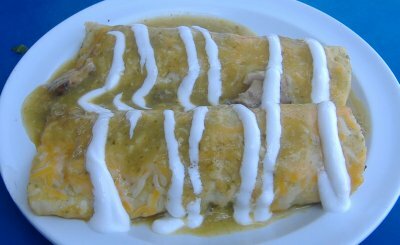 I ventured out to try a specialty of Moreno's - the chorizo's enchiladas. I had high hopes for this dish but found it unbelievably bland. There really was nothing special about this specialty. But it seems I just made a bad choice on a menu full of items that others all enjoyed. 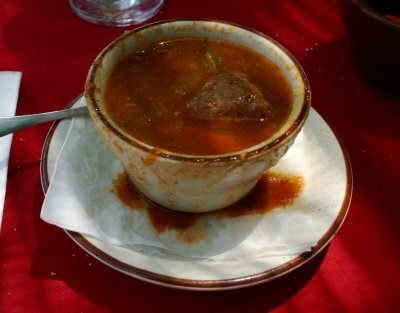 The best part of my meal was the albondigas soup that started it. It was a very good version of this classic. 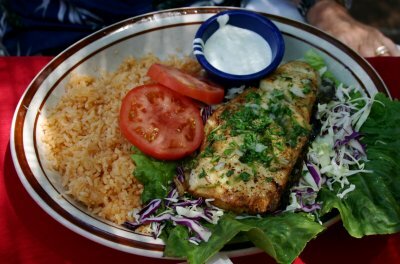 The halibut steak and chcken fajitas looked especially good and the people ordering them seemed to enjoy them quite a lot. Lots of big groups fill the tables for Sunday brunch, many celebrating events. 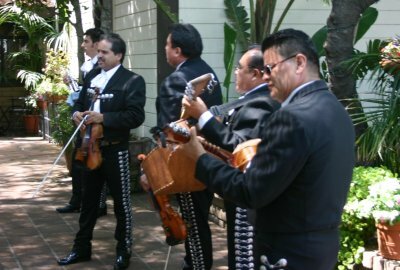 There is a live mariachi band playing throughout the patio all of which lends a real party atmosphere. 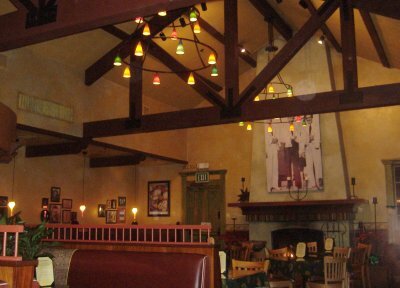 If you want to get the gang together and have a celebration then Moreno's is a great place to do it.